First off is the new race results screen, which should be easier to follow and additionally has a nice animation when playing Grand Prix. First, it shows the usual race time table, just as after a quick race. 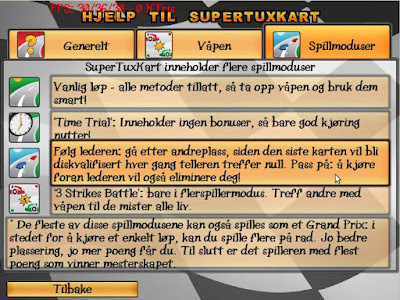 But afterwards it switches to a new table where it shows how many GP points you have, plus how many points you just earned, and increases the GP points accordingly. Then it moves all GP participants to their new positions. And if you don't want to wait for the animations, you can press the fire key to continue. Apart from me forgetting to sync to VBlank, and some erroneus points, everything looks great. Also, some music has been removed, and some has been added/updated. I'm not going through that now, since things may change more later, but as for the updated song, Krobonil should get our thanks for his update on the music for 'Snow Mountain'. Yet another gameplay detail has been added recently, namely slipstreaming. 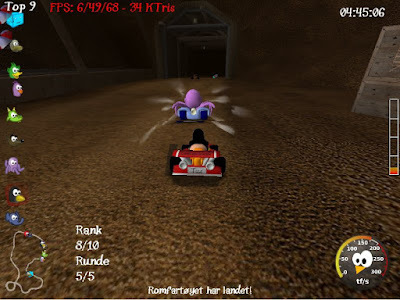 When a kart drives behind another one for a while, and then moves out of the slipstream, it recieves a speed boost and can then overtake the kart in front. 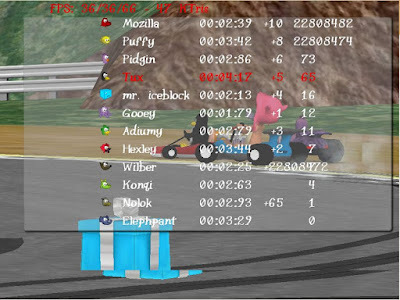 Furthermore, we've got a new code contributor, jmimu, who made the kart rank icons on the left show attachments, and animate when a kart overtakes another, or when it explodes. 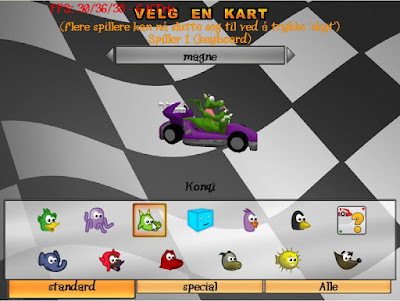 Rank is also added as text, in case you use more karts and there isn't enough space to show all kart icons. Also, the human player icons got a nice rounded outline, similar to what the 0.6 branch had. But this one is animated! And, lots of bug fixes and general niceness increase has happened as well. One of the minor nice things I'd like to mention, is that STK now shows a loading screen as fast as possible when starting the game, before loading the rest of the game. So now you won't get angsty because the GUI doesn't show up in the first few seconds. Nice, I am impressed. I (obviously) can't wait to give this a try. Time to give SVN compiling another shot! Definitely looking forward to the next alpha, or maybe it should be beta now, release. Gee, that looks very nice all together! I can't wait to play it especially to find out how slipstreaming works. my idea at the programmers of stk? please?